After watching an episode of Throwdown! with Bobby Flay featuring sticky buns from Joanne Chang's Flour Bakery + Cafe in Boston, I immediately told myself that I needed to make a stop there whenever I found myself in the historic city. I went there two years ago with a bunch of college friends to visit graduate schools, and I absolutely fell in love. The pastries were perfectly scrumptious (Ms. Chang's signature "sticky-sticky buns" lived up to all that hype and then some), and the cafe offerings (I tried a portobello melt and a cup of mushroom barley soup with sweet Italian sausage) used really fresh ingredients and flavors, adding a wonderful homemade feel to them. I've been meaning to go back ever since, so when I found out Ms. Chang had a new cookbook out (one showcasing her bakery's lovely and mouthwatering offerings) and was coming to NYC to sign books, I was totally on it! Ms. Chang was actually a Harvard alumna who graduated with a degree in Applied Mathematics and Economics. While studying at Harvard, she discovered a dormant penchant for baking. She would bake for friends during study breaks and sell cookies to a local campus cafe. After graduation, she worked at a consulting firm for a couple years, then deciding to drop everything and become a chef/baker. After gaining experience in Boston at Biba and Bentonwood, she moved onto Rialto in Cambridge and then finally to the Big Apple to work for Francois Payard! After spending a year at Payard, Ms. Chang decided to move back to Boston to begin planning to open her own bakery (now Flour). During the planning stages, she took a job at Boston's popular hotspot, Mistral. Two years later, Flour came to be, and subsequently two more locations! Now with all that background, let's head back to the book signing that night! I asked Marcus to come with me, as we had seen the episode on Food Network together when we first started dating (it was my second time viewing the episode :D). 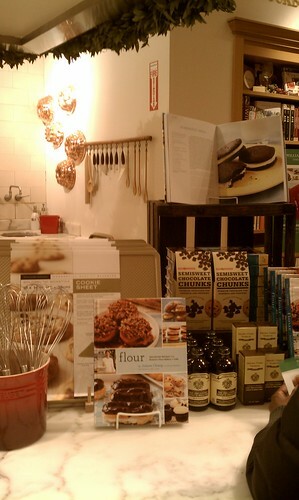 We got there a little early and found her setting up a demonstration at the store for a recipe from her new cookbook! 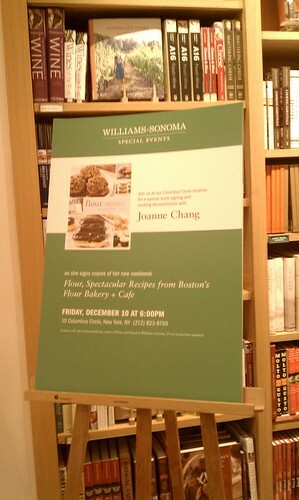 Per usual, Williams-Sonoma had a bunch of the featured cookbooks displayed along with "related" culinary wares! Notice the copy of the book at the top is opened to the page with Ms. Chang's featured demonstration that night, homemade oreos (located on page 134-135). 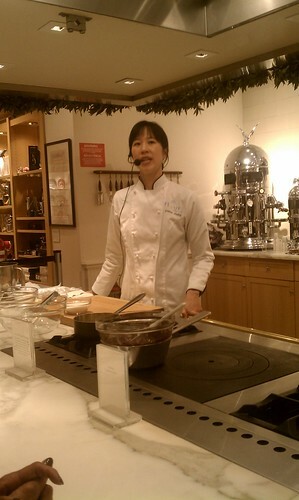 Ms. Chang starting her homemade oreo demonstration in the Williams-Sonoma kitchen area. Flour Bakery stresses the use of real butter and chocolate. The touchstone of Flour Bakery and its new cookbook features nostalgic recipes (as many of the bakery's offerings are Ms. Chang's take on the universal American treats (e.g., Oreos, s'mores, Pop Tarts, etc. ), that is, childhood desserts recreated. She mentioned how she grew up in a traditional Chinese family, where she "rarely had a chance to indulge her sweet tooth at all" as most Chinese meals tend to end with nothing really sweet--usually orange slices and other assorted fruits. She also talked about how she loves to use unsalted butter when she bakes. Salt is used as a preservative, which means that the salted butter you get in stores may be older than desired. Because the salt content of the butter varies from manufacturer to manufacturer, the product itself is inconsistent. Ms. Chang likes to add her own salt (i.e., kosher salt--the "chef's salt") to recipes, noting that if you'd like to use regular salt instead of kosher salt, you would just tweak her recipes to half the required amount. My favorite part of her demonstration was how she described vanilla to have a "rounding" effect, salt to have a "sharpening" effect, and chocolate to have a "sweetening" effect on baking, respectively. I can't seem to explain why, but I totally follow that train of thought! Throughout her demonstration, she gave little tips on how to execute her homemade oreo recipe smoothly (e..g, how to make the oreo cookie dough round, using salt, whisking techniques, making your own pastry bag for icing/frosting using a Ziploc bag, etc.). 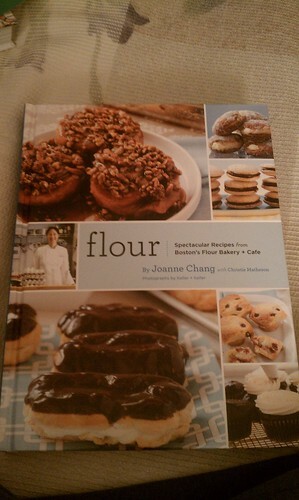 My copy of Flour: Spectacular Recipes from Boston's Flour Bakery + Cafe. I got to meet Ms. Chang at the end of the demonstration, when she was signing books for attendees. She's so exuberant and eager--everything you need to be a baker! 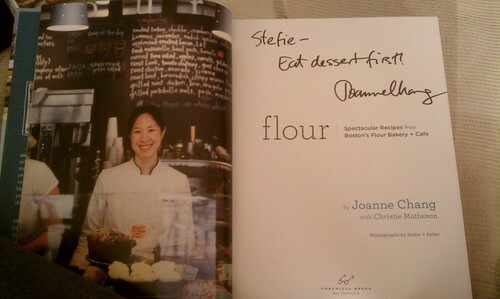 So here's my signed copy: "Eat dessert first!" she wrote--love it! Findings: Growing up in a Chinese family, I can definitely relate to Ms. Chang's diving head first into baking, especially finding new ways to create nostalgic childhood treats. My mom never baked anything with me while I was growing up. In fact, the first time we baked anything together was when I was home from college! All of my family's weekly meals at home would also be punctuated with fruits (mostly oranges), and on special occasions, a small helping of ice cream. I find her to be such an inspiration--steering the opposite direction from her technical Ivy League degree towards the kitchen takes lots of courage and confidence. I hope one day I can find it in me to trade in my calculator for a toque and an apron! Either way, I'm excited to start making the treats from this book. 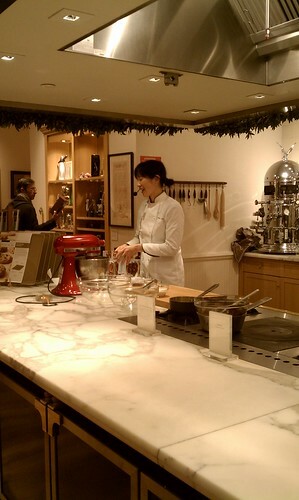 Her tips from the demonstration were very enlightening and helpful, so I gather her cookbook will do the same. So if you're ever in the Boston area, please make a stop at one of Flour's locations--you won't regret it!